Dr. Vandana Shiva's most radical and important ideas are represented in lucid form in this essential primer for those who wish to understand the forces and expose the motives of those who threaten our planet. 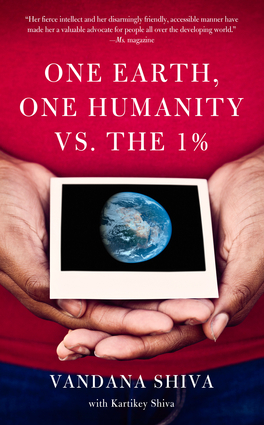 Her vision of "one earth, one humanity" and its scientific and cultural roots are explained in depth; the monopolistic economic machinations of the 1% are exposed; the genetic manipulations of Monsanto and its Nazi roots are uncovered; and "philanthropists" such as Bill Gates are exposed as the new Robber Barons. Vandana Shiva's struggles on the streets of Seattle and Cancun and in homes and farms across the world have yielded a set of principles based on inclusion, nonviolence, reclaiming the commons, and freely sharing the earth's resources. These ideals, which she calls "earth democracy," serve as an urgent call to peace and as the basis for a just and sustainable future. With precision and passion she explores the issues she helped bring to international attention—genetic food engineering, culture theft, natural resource privatization, and the role that unrestricted capitalism has played in the destruction of environments and livelihoods. Unafraid to confront authority and name names, this slim book exposes the global elite, uncovering their links to the rising tide of fundamentalism, violence against women, and planetary death. Vandana Shiva is a world-renowned environmental thinker and activist, a leader in the International Forum on Globalisation, and of the Slow Food Movement. Director of Navdanya and of the Research Foundation for Science, Technology and Ecology, and a tireless crusader for farmers', peasants' and women's rights, she is the author and editor of a score of influential books—Seed Sovereignty, Food Security; Making Peace with the Earth; Soil Not Oil; Globalisation's New Wars; and Who Really Feeds The World? A 2012 Fukuoka Grand Prize Laureate, Shiva is the recipient of over 20 international awards, including the Save the World Award (2009); Sydney Peace Prize (2010); Calgary Peace Prize (Canada, 2011); and Thomas Merton Award (2011). Kartikey Shiva, son of Dr. Vandana Shiva, is trained in computer science and professional photography.